Have you ever noticed how the walls of your Hot Tub feel slimy? Well that's because they are covered in something called 'biofilm'. Biofilm attaches itself to the walls of your Hot Tub, and even more so to the insides of your pipework where it lives undisturbed. Now, did you know that 99% of bacteria in a Hot Tub lives in that Biofilm? That's right, just 1% of the bacteria in a Hot Tub lives in the water. What's even more alarming is that regular Chlorine sanitisers don't attack the biofilm, so if you are treating your Hot Tub with Chlorine, you're only killing off 1% of the bacteria! The unique AquaFinesse solution breaks down the BioFilm which sticks to the inside of your pipework and the Hot Tub walls, so that 100% of the bacteria can be destroyed. With one simple weekly treatment AquaFinesse customers enjoy the luxury of bathing in Pure, Clean, and Crystal Clear water without the need of time consuming, multiple daily measurements and high doses of harsh chemicals. The result is fresh, crystal clear water which is so gentle on your skin that you will actually feel the difference. Treat yourself to the most luxurious water imaginable! AquaFinesse is Pure, Clean, Simple and approved by Mother Nature! 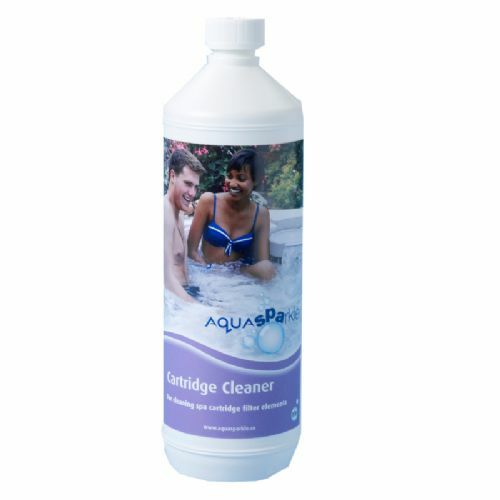 Each pack of AquaFinesse will last between 3-6 months, depending on the size of your Hot Tub. Hot Tub owners who are looking to use AquaFinesse for the first time should also purchase a Spa Clean tablet (see related items below). As the AquaFinesse will break down all of your existing BioFilm, the Spa Clean tablet is required to ensure this is dealt with effectively. Once you've switched to AquaFinesse however, you won't want to switch back. For more information, download the AquaFiness PDF by clicking the PDF logo below.